He said, "Go out, and stand on the mountain before Yahweh." Behold, Yahweh passed by, and a great and strong wind tore the mountains, and broke in pieces the rocks before Yahweh; but Yahweh was not in the wind. After the wind an earthquake; but Yahweh was not in the earthquake. After the earthquake a fire passed; but Yahweh was not in the fire: and after the fire a still small voice. Know that no influence surpasses the WILL of the entity. Make that will, then, one with that which is the entity's ideal. Meher Baba (born Merwan Shehariarji Irani, 1894-1969) is a philosopher to some, a spiritual guide to others and the messiah to many more. Beginning in 1927 he establishes a convent or ashram in the Sufi tradition and surrounds himself with a small group of disciples, some of whom remain with him for the rest of their lives. 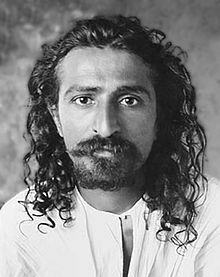 Meher Baba spends much of life exemplifying his motto of “Mastery in Servitude” by helping the poor, lepers and the mentally ill.
To Westerners Meher Baba may seem like any other spiritual master from Asia, and much of his teachings are little more than a reflection of ancient teachings. Yet, there are significant differences that set him apart. His universal acceptance of all major religions as legitimate paths to salvation is paramount. It is not the dedication to a particular dogma and ritual that offers salvation, it is the absolute faith and devotion to God. To truly love God requires that we love and embrace everyone and everything as a dimension of God. Meher Baba lives simply and modestly, receiving no personal benefit from his position and fame. In 1925, he begins a silence to emphasize that all that needs to be said about God and religion has been said. During his silence he communicates laboriously. He writes for a couple of years, then stops writing completely and use an alphabet board. Nearly a decade after the silence beings he gives up the board and uses his own personal sign language, which is understood only by those closest to him. Through this akward method he offers several “discourses” or teachings, as is the manner of a Sufi Master, and many of these have been compiled into books written by him through others during his silence. While they serve as a useful unified resource within the context of Meher Baba’s life, they have little new to say about religion or God that has not been said before. The greatest exception to this is God Speaks, which is a reorientation or distillation to essence of Sufism for practice in the West. Meher Baba is very specific that we must live in the world. We must have jobs, families and be part of our communities in a manner that brings purpose to our faith. In the West the life of an ascetic does not have the same significance as being a dervish in India. While daily meditation and inner contemplation are useful in a spiritual quest, these can be detrimental if taken to an extreme as a lifestyle without the direct guidance of a spiritual master. There is no substitute for living in the world responsibly, honestly, devotedly and in service. Meher Baba once said that if anyone claims to be The Messiah, do not believe him and do not follow him (paraphrased). Yet, Meher Baba claims to be the Avatar, God in human form. This is not a contradiction, for he specifically does not want to start a religion and asks no one to follow him, although many chose to do so. As he proclaims, “I have not come to teach but to awaken” implying that his time on earth is to perform universal work and not start a movement. He talks about the breaking of his silence, not as some grand announcement, but as a personal realization of God’s presence in the lives of individuals, one at a time. Just as a drop of rain causes little noise, it is only when all the drops slowly and eventually are unified in a swollen river that the silence breaks into a roar. There is no umbrella religion, formal practices or creeds surrounding Meher Baba. No one is in charge of the movement, there are no priests, and there is no one central organization. There are many who practice various aspects of Sufism as outlined in “God Speaks,” but most followers independently embrace Meher Baba as their personal Christ, drawing focus and inspiration from a few pictures, books and a growing community of believers. Some meet in small groups in homes to sing songs, study the Discourses, and share experiences and stories while others carry their faith alone, making pilgrimages to various spiritual centers. There is no missionary movement to convert new members, for all religions are true. The Awakening is one that comes from within, and people are drawn from the heart and not by recruiters. Nonetheless, there are tens of thousands of people that believe that Meher Baba is The Messiah. Most are devoted Christians, Muslims, Hindus or members of some other faith who recognize Meher Baba as the most recent manifestation of God in human form. Many have had amazing and profound experiences -- personal miracles -- that have drawn them to this conclusion. Many have simply found that Meher Baba’s teachings have helped to make whole their spiritual nature after having been fractured in the mill of traditional religious doctrine and the conflicts of theology. Most important to me is that Meher Baba is a true example of living by one’s faith. It is impossible to positively verify that anyone who makes the claim is actually The Christ. However, Meher Baba offers little reason not to believe this if all of the categorical qualifications are removed: that he must be accompanied by prophesized events, he must be accepted by religious leaders, or must be of a specific religion, ethic group, or nationality. I ask myself, if Christ is alive in our time and living life with the same meaning, devotion, service and sacrifice as Jesus, what would he be like? Until I discovered Meher Baba I had found no example - and with an open mind I continue to search, but no other candidate has ever come remotely close.